Despite all my talk about not being crazy about sweets, I've apparently been baking up a storm. I'm not sure exactly why. Maybe part of it is a layover from the holidays when baked goods were everywhere. Or maybe it's just that time of the year when you find yourself craving slightly sweet bits of comfort. Not sure exactly what it is, but I'm not exactly sure I want it to end. After all, I keep happening upon all of these delicious things. Like this tea cake, for instance. I haven't had a cake like this for years. It reminds me of something someone's grandmother would have made when I was a kid and served to us as an afternoon snack. This tender cake isn't too terribly sweet. 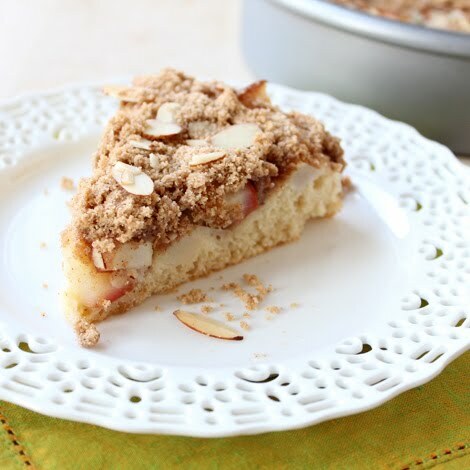 In fact it gets most of its flavor from the delicious fruitiness of fresh pears with the warmth of cinnamon, the sweetness of almond, and the delicious crunch of its buttery streusel topping. It's one of those deliciously easy cakes you can throw together in less than 1/2 hour and keep on hand for company. It's great for brunch, but you could also serve it with a little bit of ice cream for an after dinner treat if you wanted to. And it's got fruit and nuts in it, so it's good for you, right?? This post is part of Super Saturday Show & Tell. Check it out! I love it! It looks divine. Well of course the fruit and nuts cancel out the flour, sugar, and butter! It's 100% good for you. Just like pie! I wouldn't stop at brunch here. I'm thinking of a few other meals I'd be happy to indulge this tasty recipe. Visiting from the Pretty & Delicious link party ... this looks SOO GOOD! Thanks for he recipe :) Pinning! This looks delicious!! Thanks so much for linking up to the Pretty & Delicious link party - hope you'll come visit again tomorrow! !